*Katharina Frei* - Kreatives Sammelsurium: Lycka till! What is the best thing a card maker can give as a present to someone she cares about?? I decided to send her a little something to say thanks you. She loves selfmade cards so I thought of a set of cards, which I don't need hours to make, but look nice nevertheless. I started with a computer generated sentiment, which would fit in my round Nestabilities. It means "Good luck and Happy birhtday". 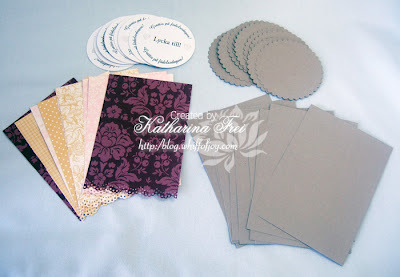 I used one of my favourite Stampin' Up design paper sets "Parisian Summer", because they coordinate so lovely and used my Martha Steward doily lace punch to give it a little extra touch. SU kraft cardstock to matt everything, then some ribbon ... é voilà! Ich beschloss meiner Freundin ein kleines Dankeschön zu schicken und da sie handgemachte Karten liebt lag es nahe ein Set zu schicken. Ich wollte natürlich nicht stunden mit 1 set zubringen, aber nett sollte es schon aussehen. Also startete ich mit einem Computer generierten Text, der in meine runden Nestabilities passen sollte. Es heißt übersetzt "Viel Glück und Alles Gute zum Geburtstag!". Eines meiner liebsten Stampin' Up Motivpapiere mußte herhalten (die sind sowas von ergiebig :) "Parisian Summer". Die passen immer so schön zusammen. Mit dem Martha Steward doily lace punch habe ich noch das gewisse Extra hinzugefügt. 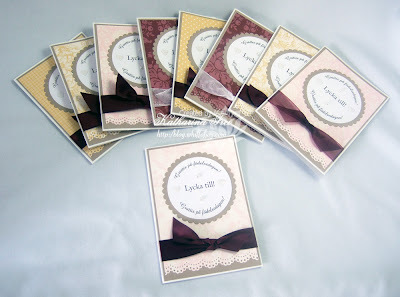 Hinterlegt ist alles mit Kraft cardstock von Stampin' Up. Dann noch etwas Band...é voilà! 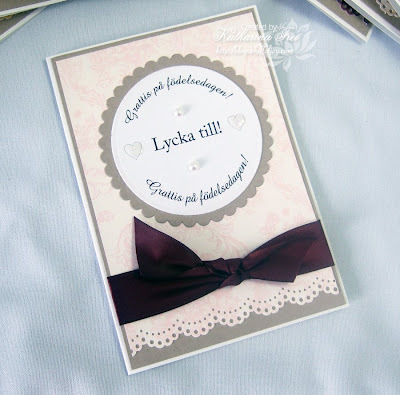 I put some SU crystal effects and glitter on the tiny hearts and 2 halfpearls above and below "Lycka till". Ich habe etwas Stampin' Up crystal effects und Glitzer auf die winzigen Herzen getan. Über den Text "Lycka till" (Viel Glück) habe ich noch 2 Halbperlen gesetzt. All stamps from the WoJ / Elisabeth Bell Spring Stamp Kit are now available via the Whiff of Joy store. The Cute Card Thursday Challenge is up with the theme "Signs of Spring". The amazing and lovely Bev has a fabulous blog candy running to celebrate her birthday. Don't forget to join the Whiff of Joy Guest Designer Call. Lovely cards, she may not want to use them! Nice thought. That's a fantastic present! I'm sure it'll really be appreciated. Das ist doch mal ne echt schicke Massenproduktion!!! Fantastic gift idea, love it! Oh wow these are all so gorgeous and what a lovely gift for your friend. Die sehen klasse aus, ein wirklich schönes Geschenk! It's so beautiful cards !!! What a beautiful gift! I'm sure your friend will be thrilled with these lovely cards. Ein wunderschönes Set hast Du zusammen gestellt! Sag mal, ich lese sehr oft, dass Du die Texte am PC generierst. Mit Word bekomm ich das nie so schön und vorallem passend hin, wie Du. Wäre klasse, wenn Du mir ein paar Tipps geben könntest. What a nice present and I must say that I jumped when a saw the swedish word on your blog haha. What a thoughtful gift Katharina and so pretty!! Oh wow,die Karten sind wunderschön und sehr edel! Ein tolles Beispiel,wie man auch mit "wenig" sehr schöne Karten machen kann!